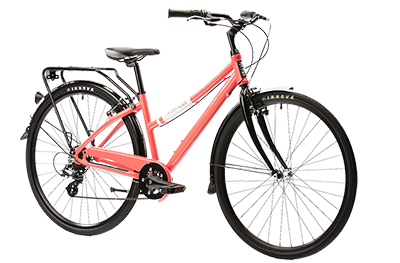 Available for all ages and abilities, Our bikes are perfect for town or country. Visiting Canada's Capital region has never been so fun or easy! RentABike is user friendly! Pay upon return. Relaxed pathway riding? Performance? We will set you up with the right bike, and give you everything you need. Locks, maps, helmets, and more... all included! Great Pathway bikes to high-performance carbon road bikes, we make sure that everyone is satisfied. Looking to rent for a couple of hours, weeks or months? We have the best rates, tax included. Bikes, helmets, maps, paniers, locks, and even clipless shoes & pedals! We have a bike for you! Family? Triathlete? From pathway bikes to road bikes, Rentabike is able to fit you with the perfect bike. Rideau Canal north end ‘under’ Rideau St.
BIKE RENTAL STARTING AT $9/H! Our bikes, available in all sizes, are perfect for anyone looking to ride around the city. Visiting Ottawa has never been so easy! No need to worry when you come at RentABike! We will set you up with the right bike, and give you everything you need. Locks, maps, helmets, and more… all included! Looking to rent for a couple of hours, weeks or months? We have the best rates, tax included. Come check it out! Family? Triathlete? From pathway bikes to road bikes, RentABike ProFit* will set you up with the perfect bike. Perfect for paved trails while sightseeing. Sizes available for adults, youth & infants. Check our rates!Check our bikes! Built with a lightweight aluminum frame, lots of stand-over clearance, and easy-to-use gears, this is the rigid version (no front suspension) of the XTC Jr. family. 20-inch wheels and smooth-rolling tires that can handle the trail, it’s a fun and stable way to get started on the trail. Try something unique! Our KHS Alite is built for two! Explore the city with the help of a friend. Get off the pavement and onto our trails! Explore Gatineau Park and Kanata Lakes. We’ve got a top selection of fast ultralight aluminium & carbon-fibre road bikes. Low-gear riding experience for all urban and country routes. ALUXX SL aluminum technology blends speedy acceleration with overall comfort and control. Seamless disc-brake integration means confident braking in variable road and weather conditions. Composite seatpost dampens road vibration for a better ride quality. OverDrive tapered steerer tube and PowerCore bottom bracket ensures precise handling and maximum pedaling efficiency. Includes tax, hemlet and tools. Please advise about pedal choice. Women's specific (saddle, reach, handlbar) carbon frame with Shimano Ultegra gearing, Giant road wheelset. Carbon comfort for a variety of rides, climbs, decents. Helmet, tool kit (lock not recommended due to model's high value). Please advise pedal choice. Starting at only $70 for 24 hours! Ideal upgrade from aluminium Avail. Women's specific (saddle, reach, handlbar) carbon frame with Shimano Ultegra gearing, Giant road wheelset. Carbon comfort for a variety of rides, climbs, decents.